Ten days tour to Uzbekistan visiting most breathtaking architectural ensembles of the Great Silk Road and cross through Kyzyl-Kum desert, stop over on bank of Amudarya river, ten days to feel yourself being dropped back several centuries ago, ten days to visit "Ruins of Afrosiab" State archaeological reserve (6 BC-13 AD) museum, Chashma-Ayub Mausoleums (14 c), Poi-Kalyan Ensemble including Minaret (12c) etc. Arrival to Tashkent, transfer and accommodation in hotel. Transfer to Airport. Flight to Urgench at 7:00 arrival to Urgench at 8:40. Transfer to Khiva. Accommodation in Hotel. Sightseeing tour in Khiva: Kunya-Ark fortress, including Kurinish Khana (17c); Mohammed-Amin-Khan(19c) Madrassah, Islam Khodja Minaret; Palvan-Kari complex, Abd Al Bobo complex(18c), Rafanek Madrassah, Mohammed Rakim Khan (19 c), Amir-Tur Madrassah, Sho-I-Kalandar Bobo Mausoleum. Sightseeing tour in Khiva: Mazary Sharif Madrassah, Kheivak well (10c), Uch Avlioli (“three saints”) Mausoleum, Juma Mosque (18c), Kutluq-Murad Inaq (19c) Madrassah, Pakhlavan Mahmoud Mausoleum, Tash Hauli (“stone yard”) Palace, Alla-Kuli-Khan (18c), Arab Mohammed Khan(18 c) Madrassahs. 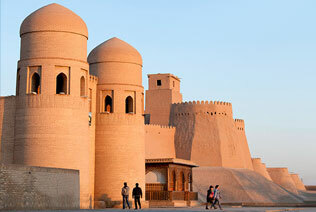 Transfer to Bukhara through Kyzyl-Kum desert, and stop over on bank of Amudarya river. Arrival to Bukhara and accommodation in hotel. Sightseeing tour out of Bukhara: Visit to summer residence of Emir - "Sitorai-Mokhi-Khosa" (1911). Free at leisure time, shopping. Transfer to Kyzyl-Kum desert via Nurota city. On the way visit old mosque and the ruins of Alexander the Great’s fortress and petrogliph’s. Dinner around the fire place. Transfer to Aydarkul lake, swimming, free at leisure time. Lunch on a lake shore. Depart to Samarkand. Arrival and accommodation in hotel. Free at leisure time. Sightseeing tour in Samarkand: Gur-Emir Mausoleum (15c), Registan Ensemble (including Ulugbek (15c), Shir Dor (17c), Tillya–Kari Madrassahs (17c), Bibi Khanum Mosque. Visit to Samarkand bazaar. Shah-i-Zinda necropolis (14-15c), "Stars above Samarkand": tour to Ulugbek observatory (15c), “Ruins of Afrosiab” State archaeological reserve (6 BC-13 AD) museum. Carpet factory. Transfer to Tashkent, arrival and accommodation.